Thank you all for your sweet comments on instagram and here on the blog about the new website! I’m thrilled and I hope you all continue to enjoy the blog and all the new features. I love the Dish up a Vegetable section which will continue to evolve over the months– I launched the site with just the core veggies that I adore and will continue to add more as we move along. So again, thank you all for being here and continuing to follow us along on our farming and cooking journey! Alright, onto this pasta! This dish is just what our bodies have been craving after the long holiday weekend. We’ve been busy winterizing the farm and are still harvesting quite a bit considering the time of year and the crazy stormy weather. Snow is on the way and I can’t believe we’re almost in December. Pinch me! Thankfully, the kale is thriving and the barn is stocked with plenty of winter squash so this pasta was a no brainer. The white wine cashew sauce is spoon worthy and pairs really well with the sweet butternut squash and earthy kale. I hope you all love this simple weeknight dinner as much as we do. Pour a glass of wine and dig in! Place the drained cashews in the bowl of a high speed blender and set aside. Heat the oil in a skillet over medium heat. Add the shallot, garlic and crushed red pepper flakes Cook, stirring often, until fragrant, about 7-10 minutes. Deglaze the pan with the white wine and season to taste with salt and pepper. Simmer the mixture until most of the liquid evaporates, about 3-5 minutes. Add the garlic & wine mixture to the blender with the cashews. Add the lemon juice and 3/4 cup of water. Blend on the highest setting until smooth and creamy. Scrape down the sides and add more water a little at a time, until you reach your desired consistency. The sauce should be the consistency of a thick (pourable) cream. Taste test and add additional seasonings if necessary. Toss the cubed butternut squash with 2 tablespoons of olive oil and season with salt and pepper. Place on a rimmed baking sheet and roast in the oven until tender and lightly browned, about 25 minutes. Toss halfway through baking. In a large bowl massage the torn kale leaves with the remaining 1 tablespoon of olive oil until the kale turns bright green and tender. Set aside. 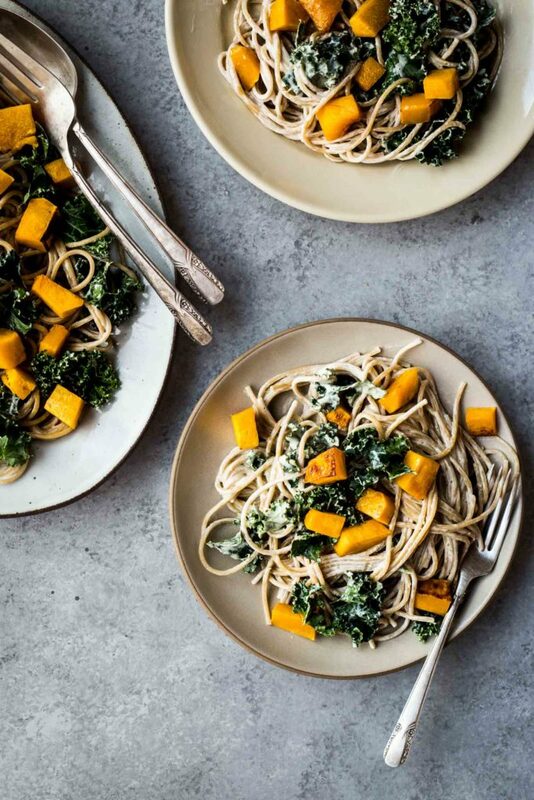 Toss the pasta with the butternut squash, kale and half of the cashew cream sauce. Add a little of the reserved cooking liquid if the pasta seems too dry. Taste test and continue to add more sauce as needed. Wow, that sauce sounds like just what I need tonight! Any ideas of what I could do with any leftover sauce? Oh, and, I’m loving the new website! And of course I can’t wait to get my hands on your book! There, I said it all! Thank you! And this sauce is AMAZING!! Leftover sauce tastes great drizzled on roasted veggies, drizzled on avocado toast (seriously good!) or as a dip for raw veggies like carrots, celery and kohlrabi. Let me know what you think! HI, love the changes but miss being able to print the recipes. you’ll just need to print the page instead of the actual recipe. Otherwise it’s easy to bookmark on the new site! Thanks for following along! The sauce was delicious but I won’t make the recipe again. It’s a lot of work and takes much longer than 30 minutes. The squash is hard to peel/cut, & trying to mix the thick sauce in was very time consuming & tedious. The sauce lost most of it’s flavor when incorporated. It would be better to use the full amount of same but that’s probably fattening! One tip that saves me when peeling and cutting squash is to microwave it for a minute or two, or pop it into a 350 degree oven for 10 or so minutes. Let cool enough that it won’t burn you, then prep it. Heating the squash loosens the skin so that it’s easy to remove with a vegetable peel, and softens the squash for easier cutting. It saves tons of prep time! I made this last night and it was stinkin’ delicious! My lactose intolerant husband loved it and it was truly hearty and soul-warming. I actually ended up using all of the sauce. Either I’m way too indulgent, or my butternut squash was on the larger side. Andrea I love your recipes, every one I’ve ever made has been a hit. I’ve pre-ordered your cookbook too, (something I’ve never done in my life) I just know it will be a keeper. Another great recipe! This was perfect for a snowy Midwest day! This was amazing! thank you for another winner. That sauce is going on everything from now on!